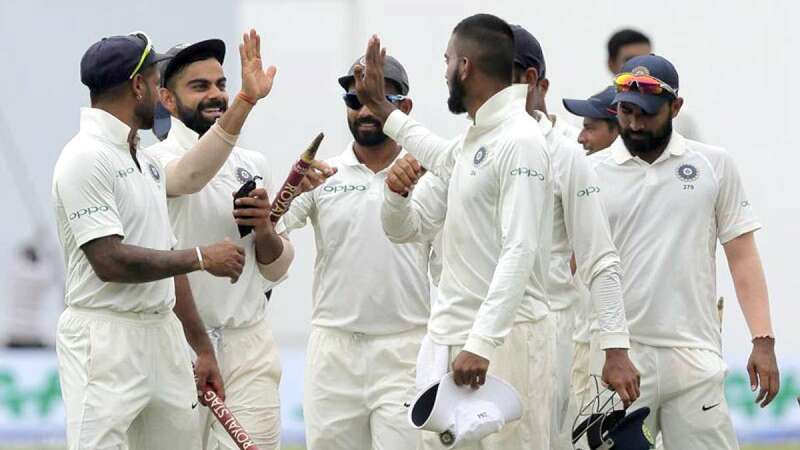 Colombo : India thrashed Sri Lanka by an innings and 171 runs on the third day of the third and final Test match to sweep the series 3-0 at the Pallekele International Cricket Stadium here on Monday. Chasing the first innings deficit of 352 runs after being asked to follow on, Sri Lanka were bowled out for 181 in their second innings. India had posted a total of 487 runs before dismissing the hosts for 135 in the first innings. For India, off-spinner Ravichandran Ashwin grabbed four wickets and pacer Mohammad Shami three. India had won the first match of the series by 304 runs and then thrashed the hosts by an innings and 53 runs in the second Test. This is the first time that India have whitewashed Sri Lanka in a Test series in their own country. Middle-order batsmen Dinesh Chandimal, Angelo Mathews and Niroshan Dickwella staged a desperate battle to prolong Sri Lanka's struggle in the second innings. Coming together after the entire Sri Lankan top order had returned to the pavilion, Chandimal and Angelo Mathews added 65 runs between them in 27.4 overs. Chandimal scored 36 runs off 89 balls with four hits to the fence. Mathews scored 35 off 96 deliveries with two boundaries and a six studding his innings. Dickwella later scored 41 runs off 52 balls even as the Sri Lankan resistance crumbled. Resuming at the overnight score of 19/1 in their second outing, Sri Lanka were off to a horrible start, losing three wickets within the first hour of play. The hosts were reduced to 39/4 before Chandimal and Mathews started their fight back. The hosts suffered their first jolt in the third over of the day when overnight batsman Dimuth Karunaratne was outfoxed by the extra bounce of an Ashwin delivery. The ball brushed the batsman's gloves before being caught by Ajinkya Rahane in the slips. Malinda Pushpakumara patiently battled 32 deliveries for his one run before being caught behind off Shami's bowling. The right-hander was repeatedly beaten outside the off-stump by Shami, but managed to survive somehow. His luck finally ran out when he came on the front foot to a fuller length delivery on the off-stump line, only to see the ball knick the outside edge of the bat on its way to the gloves of Indian wicket-keeper Wriddhiman Saha. Shami then sent back Kusal Mendis in his next over to put the Sri Lankans in deep trouble. Kuldeep Yadav got the next breakthrough for India when he broke the partnership of Chandimal and Mathews around half an hour after lunch. Chandimal was surprised by an extra bit of bounce as the ball clipped the inside edge before being caught by Cheteshwar Pujara at forward short leg. This was Kuldeep's first wicket in the second innings of a Test match. Mathews followed a couple of overs later after being trapped leg before by Ashwin. That started the downfall for Sri Lanka as none of their tailenders could manage to reach double-figures.